The first permanent building for the Union was constructed on this site in 1910- 1912, to designs by the Government Architect, Walter Liberty Vernon. The Holme Building is undergoing major redevelopment and access may be limited. However, toilet facilities are available. Built in the Federation Arts and Crafts style, the Union building featured sloping buttresses, gables with a sandstone coping and Gothic Revival style detailing to the main archway and the crenellated parapet. Although the forms are Gothic in inspiration the carved decorative detail is Arts and Crafts/Art Nouveau style. The carved mullions to the windows were also sandstone. 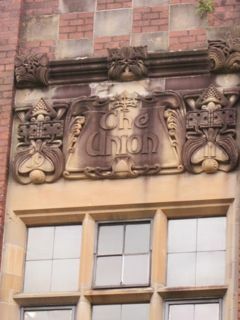 There is a carved panel to the main entrance bearing the words ‘The Union’ and the date 1911. The original face brickwork with carved sandstone detailing survives. For better or worse much of the inside was stripped out and remodelled in 1967-9. 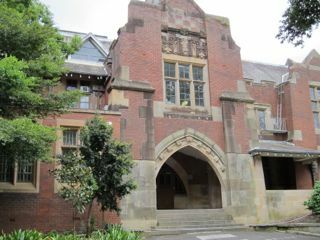 The Sydney University Union was established in 1874 on the model of the Oxbridge Union Societies. In 1884 the Senate provided a men’s common room to the south of the Macleay Museum. Following the decision to fund a permanent building from the Challis bequest, in May 1907 the site beside the original engineering building (the first Peter Nicol Russell building, now demolished or incorporated) adjoining Parramatta Road was chosen. It gradually extended alongside Science road round the cottage as far as the R D Watts building. A tea room was added in 1913. The Union Hall was completed by B J Waterhouse & H V Vernon in 1916. In 1923-1924 the Refectory was built on the west side and extended in 1940. Extensions to the west end of the building constructed in 1934 in the original style by the Government Architect included a ladies’ retiring room, small committee room and non-members’ entrance. The Union served staff as well as students. In the absence of a staff club academics used the Union. The wartime vice-chancellor, Sir Robert Strachan Wallace, made it one of his locations for contact with staff and students. At lunchtime he would sit in his favourite armchair upstairs and anyone with a problem could approach him. A pragmatist, when building was impossible he bought up and moved buildings from various places and re-erected these ‘temporary’ buildings around the campus. They were known as ‘the Wallace collection’ and one at least, the ‘Transient’ building, still survives in Fisher Road opposite the Physics Road intersection. On 1 January 1972 the men’s and women’s unions amalgamated as the University of Sydney Union. The Women’s Union building, Manning House, had been built in 1917. The old ‘Men’s Union’ was renamed the Holme Building in 1975. The current redevelopment is the latest in a long series of additions and alterations.